This contract can be used to give students extra practice with multiplication facts. There is a spot for teachers to write in which tables should be practiced. It includes 9 different easy to implement activities. 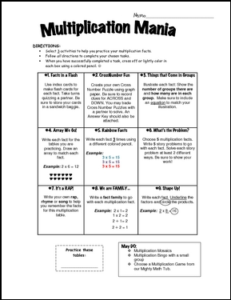 Students will love choosing activities to help them become a multiplication fact master! You can use the contract as is, as part of a math center, or assign activities from it as homework, warm ups, or classwork.